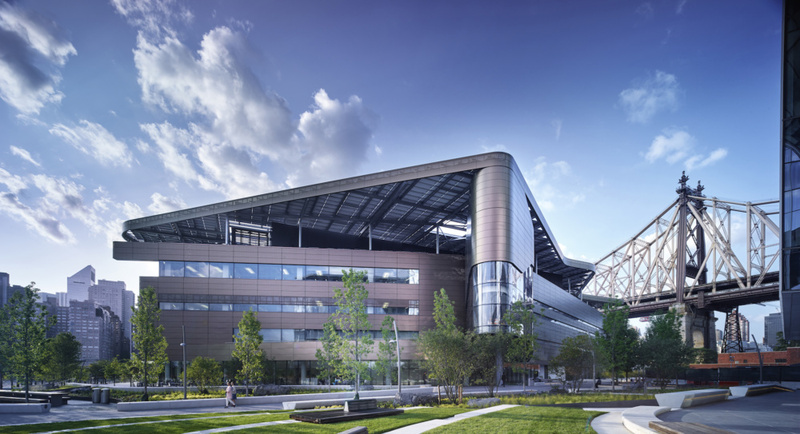 With the goal of becoming a net zero building, The Bloomberg Center, designed by Morphosis, forms the heart of the new Cornell Tech campus on Roosevelt Island, bridging academia and industry while pioneering new standards in environmental sustainability through state-of-the-art design. Morphosis will be participating in the upcoming Facades+ Los Angeles conference on October 19 to 20, 2017. Stan Su, who contributed to Bloomberg Center as a member of Morphosis’ Advanced Technology team, will be co-presenting a morning workshop along with Brad Prestbo (Director of Technical Resources, Sasaki Associates), Chris O'Hara (Founding Principal, Facades Director, Studio NYL). The workshop will be divided up into three parts: a group discussion on fundamental detailing principals, case study examples of how those principles are employed, and a hands-on session where the group will reverse-engineer details from notable projects. Yesterday Cornell Tech's campus opened on Roosevelt Island, a strip of land between Manhattan and Queens perhaps best known for housing medical institutions and mental hospitals. This development definitively stakes a new identity for the island. Created through an academic partnership between Cornell University and the Technion-Israel Institute of Technology, the project is the winner of a New York City competition for an applied-sciences campus initiated by the Bloomberg administration. The campus spans 12 acres and houses three new buildings by Morphosis, Weiss/Manfredi and Handel Architects. So far, what makes the buildings stand out is their aim to be among the most sustainable and energy efficient structures in the world. The four-story, 160,000-square-foot Bloomberg Center, designed by Morphosis Architects, serves as the heart of Cornell Tech. With its primary power source on-site, it is one of the largest net-zero energy academic buildings in the world. Smart building technology developed in collaboration with engineering firm Arup includes a roof canopy supporting 1,465 photovoltaic panels designed to generate energy and shade the building to reduce heat gain, a closed-loop geothermal well system for interior cooling and heating, a rainwater harvesting system to feed the non-potable water demand and irrigate the campus, and a power system conserving energy when the building is not in use. Another striking element is The Bloomberg Center’s facade, which is comprised of a series of metal panels designed to decrease the building's overall energy demand. The Bridge, designed by Weiss/Manfredi, is a seven-story “co-location” building intended to link academia to entrepreneurship. It houses a range of companies from diverse industries that have the opportunity to work alongside Cornell academic teams. The loft-like design of the building encourages dialogue between the University's academic hubs and tech companies. The building orientation frames full river views and brings maximum daylight into its interior. At the ground level, the entrance atrium opens onto the center of campus extending into the surrounding environment through a series of landscaped terraces. The House, designed by Handel Architects, is a 26-story, 350-unit dormitory for students, staff, and faculty. It is the tallest and largest residential passive house in the world, meaning it follows a strict international building standard to reduce energy consumption and costs. The House is clad with a super-sealed exterior facade created from 9-by-36-foot metal panels with 8 to 13 inches of insulation which are projected to save 882 tons of carbon dioxide per year. Yesterday’s opening comprises just the first phase of the campus development project at Cornell Tech. 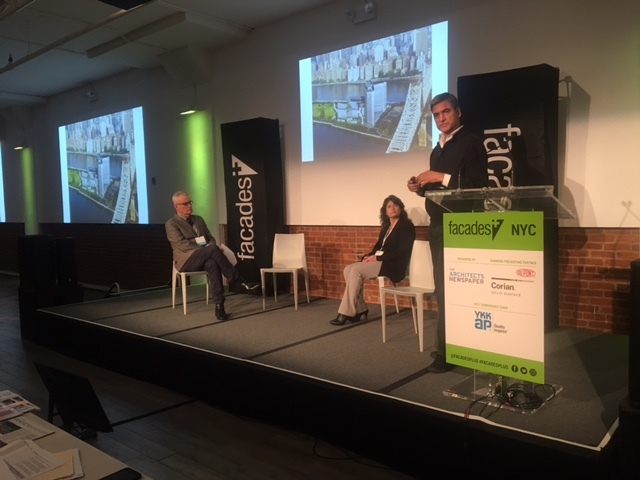 Today at Facades+ New York, The Architect's Newspaper's conference series on innovative building envelopes, AEC professionals gathered for a day of talks on the challenges and opportunities presented by the design and construction of high-performance facades. To kick off the afternoon session, Blake Middleton, partner at Handel Architects and Lois Arena, senior mechanical engineer at SWA convened to talk about “The House” at Cornell Tech. 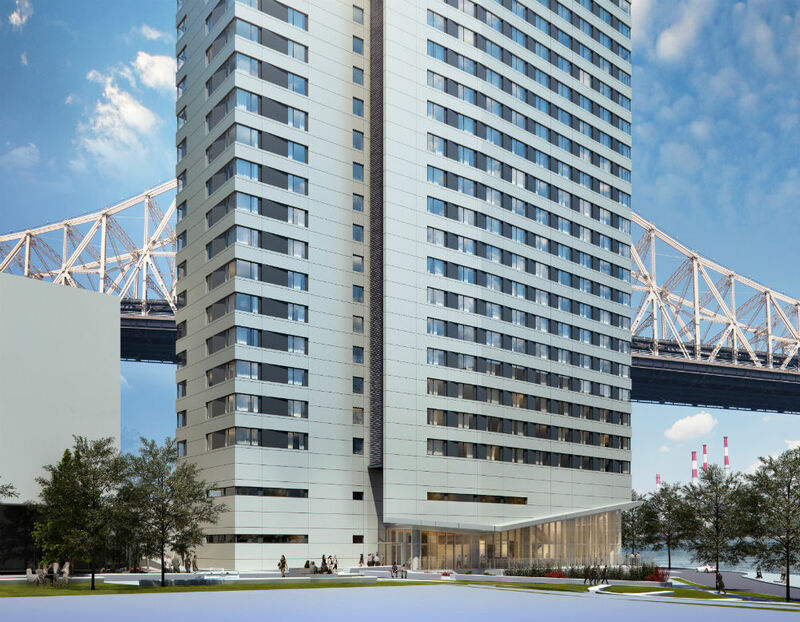 The 26-story, 350-unit building, on Roosevelt Island on the East River, is the largest Passive House–certified structure in the world. AN editor-in-chief William Menking was on hand to moderate the post-talk Q+A. Passive House certification, Arena explained, is the most rigorous building standard in the world. Why? The certification is based on performance—and the performance levels that Passive House demands are five to ten times higher than current building codes require. So, to meet the exacting standards, Arena and Blake revealed just how they rose to that challenge with their project at Cornell Tech. There are six key factors, Arena said, to achieving the certification: siting, compact shape, the proper enclosure, a low energy HVAC system, energy efficient appliances and lighting, and, crucially, user-friendliness. The Cornell Tech building is sited due south to maximize solar gains. Middleton added that minimizing the facade’s exposed surface area was key to the certification: the designers used a “wrap” metaphor for what the facade might be, a form that's connected to the geology of the island. With a facade that’s 23 percent glass, “the design goal was to break down that scale and solidity with banding,” he said. Functionally, the team used a prefabricated panelized wall frame for the facade, both for quality control and to achieve desired R-values of 19-40, depending on the wall’s thickness at various points. To really double down on efficient energy use, The House has a feedback system to encourage occupant participation whereby residents can see how much energy they are using. The system, as a result, promotes friendly competition between floors to meet or beat projected energy use. Meanwhile, a centralized mechanical ventilation system helps maintain optimal airflow, but each room—per Passive House standards—comes equipped with fully operational windows to encourage natural ventilation. 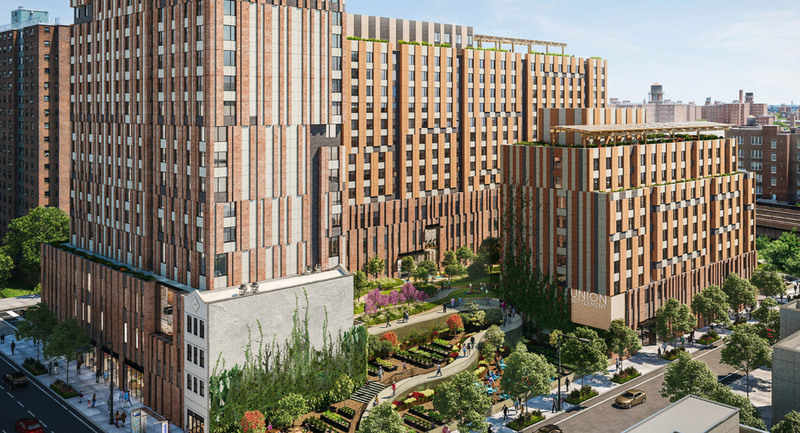 Building on the success of the Cornell Tech project, the team’s next projects include a 700-unit Passive House–certified affordable housing development in East Harlem. To find out more about The House, check out another Q+A AN did with Blake earlier this week as well as more previous coverage here. 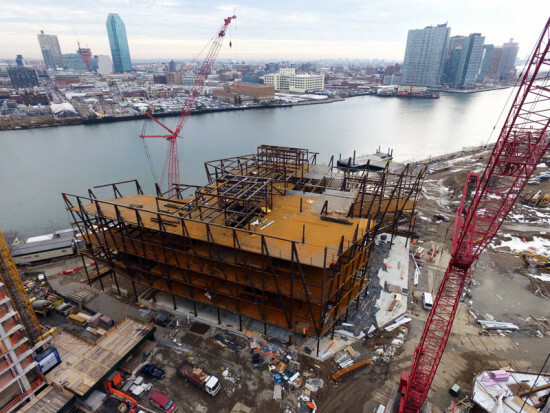 Due for completion this year, the Cornell Tech campus going up on Roosevelt Island in New York is edging closer to seeing the world's tallest Passive House building erected. The building in question is a 270-foot-tall (26-story) residential tower that will house roughly 350 units for students and save 882 tons of CO2 per year relative to standard construction—the same as planting 5,300 new trees. I got the chance to speak with Blake Middleton, FAIA, of Handel Architects, the New York–based architecture firm behind the project and discuss how the firm approached the project. Jason Sayer: I understand the project will use a prefabricated metal panel facade system. Could you expand on this? How was this devised? Blake Middleton: While the RFP from Cornell stated LEED Silver was the minimum bar for energy efficiency, we knew from early on that for this building we wanted to achieve a robust rating, at least Gold. We also knew we had to deliver the building at a cost to make the rents affordable for students. This meant using as much “off the shelf technology” as possible. We also knew that to achieve a really super-tight exterior wall: the fewer joints and penetrations in the exterior envelope, the better. This could not be an all-glass building—we would never have met our energy reduction goals with a glass curtain wall—and the average ratio of window to solid wall was going to be much lower than most typical residential towers in New York (about 30% vs 45-65% typically). This led us quickly to select a prefabricated wall system where the windows could be installed in the factory, quality control was more robust, installation time significantly shortened, and fewer joints needed to be sealed. We likened the super insulated, super-air-tight wall to a big, thick wrapping “coat” around the building. It quickly became known as The Wrap, and became a central feature of our design expression. Likewise, could you tell me about the louvers the building uses? If The Wrap is the big coat around the building, the louvers are like a “zipper” for the coat. Behind the louvers are condenser units on each floor that power the variable refrigerant flow (VRF) system which is the actual heat and cooling source for each of the spaces in the building. Did you set out to achieve the Passive House standard from the start? While formulating our response to the Cornell RFP, we became aware that Passive House principles had been applied to a large building in Germany. Our client was intrigued and came away from a visit to that building excited about the possibilities of applying this protocol to the Cornell project. Because of the immense uncertainty at the early stages—could our construction team meet the challenge? Could we afford it?—the development team remained cautious about committing to actual Passive House design requirements. Once deeper into the research and design process, and more familiar with what was required, all involved became more confident we could make this work. Everyone stepped up to commit to the effort. The development team of Hudson/Related, along with Cornell, wanted to make this a showcase of “applied science": a beta test that, if successful, could have a dramatic impact on how super energy-efficient design can be applied to buildings of scale. And in turn, how to make a meaningful impact on greenhouse-gas reduction with each building we erect in the future. Blake Middleton will be speaking at the next Facades+ conference in New York on April 6 and 7. Without going into too much detail, what will you be speaking about at the Facades+ conference? My goal for the presentation at Facades+ is to have the audience understand how the fundamentals of Passive House design can be applied to a very large building. Heretofore most Passive House projects in Europe and the Americas have been relatively small in scale. The House at Cornell Tech takes a proven set of principles and applies them to a very large building—over 270,000 and 26 stories—and is being built within a relatively tight construction budget. My hope is that people will come away from the presentation excited and encouraged that Passive House is scalable, is affordable, and can be a powerful arrow in the quiver of robust energy efficiency strategies to combat global warming. Middleton and Lois Arena of Steven Winter Associates will discuss the Passive House building in further detail. Seating is limited. To register, go to facadesplus.com. Renderings have been revealed for Cornell Tech's Verizon Executive Education Center (EEC) and hotel proposal on its Roosevelt Island campus in New York City. While the center and hotel—designed by Norwegian-American firm Snøhetta—are still pending approval from the Public Design Commission, Cornell Tech aims for the two buildings to be built by 2019. The EEC will contain event and teaching spaces. The former will cater to as many as 300 people through numerous conference rooms, a buffet lounge, and four classrooms capable of accommodating up to 75 students. Its facade comprises tightly spaced timber and aluminum mullions with glass fenestration dominating the top and bottom levels. The adjacent hotel—complete with a cafe, restaurant, rooftop lounge, and 195 rooms—will link up with the building through a shared hall. As for the campus itself, parking facilities will not be available. Pedestrian walkways, bicycle lanes, and bicycle storage facilities will comprise its circulation. 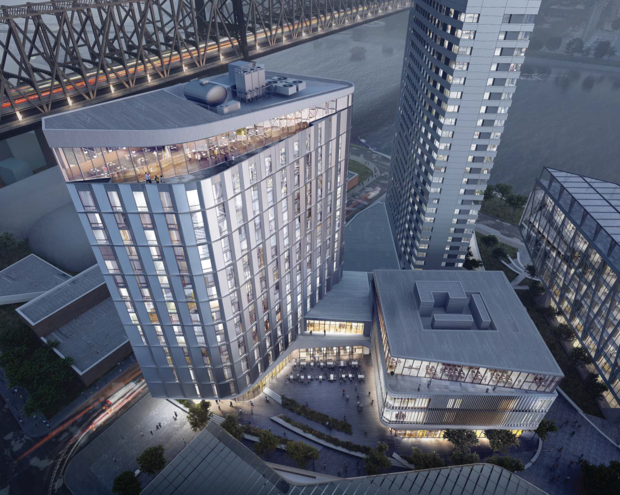 According to DNAinfo, Cornell Tech's Senior Director of Capital Projects, Andrew Winters, said he views the EEC and hotel as "the front door for the campus." The two buildings are the final part of "Phase One" (of three) for Cornell Tech's Roosevelt Island plans which are penned for completion in 2043. Residential towers are rising on the banks of the East River in Queens, Brooklyn, and Manhattan. It's easy to forget that, in the middle of the river, development at Cornell University's New York City campus on Roosevelt Island is speeding ahead. The Bridge at Cornell Tech, designed by Weiss/Manfredi, topped off Monday. That building will have a partial green roof and a photovoltaic array to produce energy for campus. Stepped lawns leading up to the entrance encourage the building's program of spontaneous social interaction to spill out onto the street. 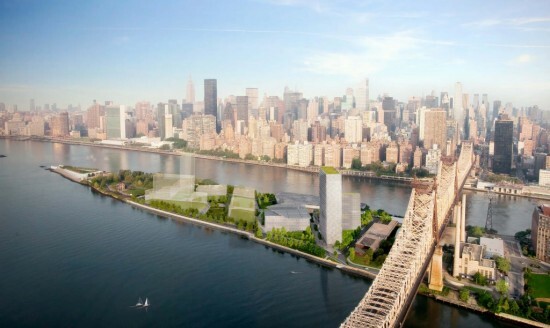 https://youtu.be/PFRIKri9Y_c Along with Cornell Tech phase one buildings, the Bridge is set to open summer 2017. When complete, the 12-acre campus on Roosevelt Island will be the home of hundreds of Cornell faculty and staff, and around 2,000 students. 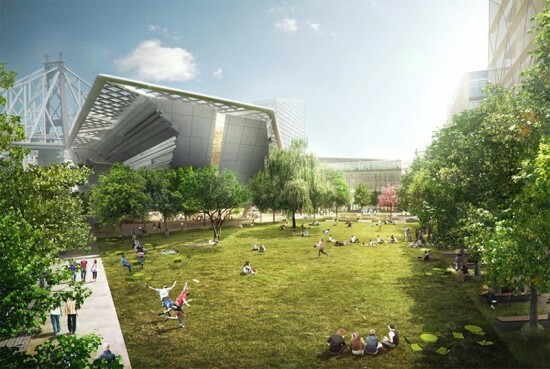 The master plan, executed by Skidmore, Owings & Merrill (SOM) with James Corner Field Operations, calls for a "river-to-river" campus with 2.5 acres of public space and ten buildings that perform to a high environmental standard. The video above gives a sense of scale and layout of the development. 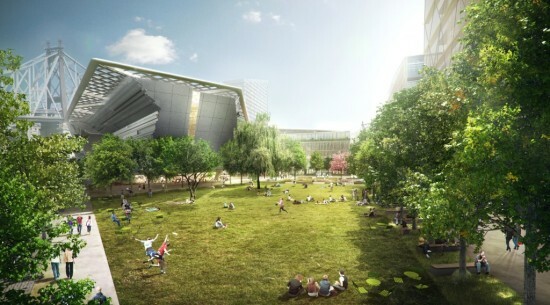 Phase one buildings include the Bloomberg Center, an open-plan academic facility designed by Thom Mayne of Morphosis Architects. The Center, which aims to be one of the largest net-zero energy buildings in the U.S., takes its design cues from the collaborative workspaces of Silicon Valley. Handel Architects designed a student, faculty, and staff residence with an ambition to become the world's first residential Passive House high-rise. Anticipation is growing for AN and Enclos’ eagerly awaited Facades + PERFORMANCE conference, touching down in Chicago from October 24th to 25th. Leading innovators from the architecture, engineering, and construction industries will share their insights on the latest in cutting-edge facade technologies that are redefining what performance means for 21st Century architecture. Don’t miss your chance to join Cory Brugger, Director of Technology for Morphosis Architects, as he is joined by a group of industry specialists to lead an in-depth dialog workshop on expanding the idea of performance in the design, engineering, and fabrication of innovative building systems. "Traditionally, performance has been defined in singular terms," Brugger told AN, "but when it comes to delivering architecture, it can encompass everything from energy usage to fabrication technique. For us, performance is multifaceted and interdisciplinary. 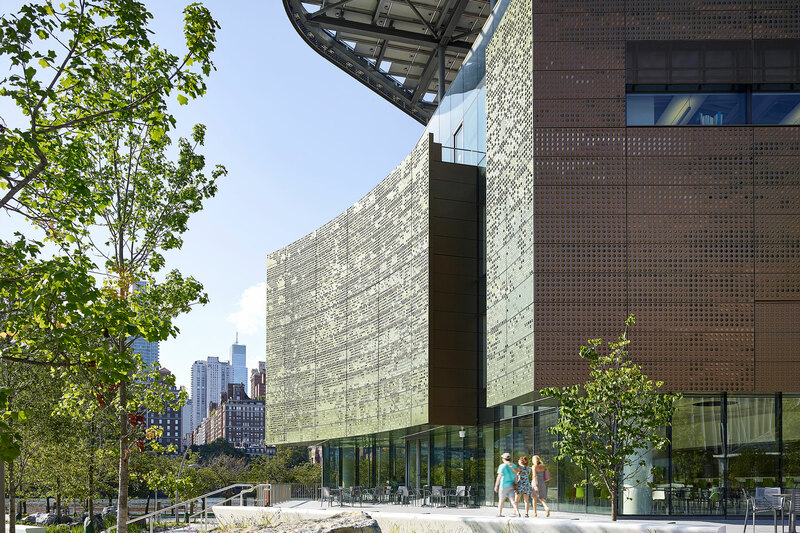 We have found that technology provides a platform for incorporating a variety of performance criteria in our design process, allowing us to create innovative architecture, like the Cornell NYC Tech project on Roosevelt Island." Set to open its doors in 2017, Morphosis’ winning design for the highly publicized Cornell Tech campus will be breaking ground on Roosevelt Island in the coming year. As part of this ambitious, 2.1 million square foot development, Brugger and his colleagues at Morphosis hope to earn LEED-Platinum certification by with their 150,000 square foot academic building by utilizing cutting-edge modeling techniques and an array of sustainable technologies. "In general, we are designing for extremely high EUI (energy use intensity) goals, which are being accomplished through the use of comprehensive models that integrate mechanical systems, day-lighting analysis, and architectural assemblies," said Brugger. "This effort is being supported by a 140,000+ square foot PV array that is integral to both the performance and aesthetics of the design. Other technologies include high performance facade systems, smart building technology, and geo-thermal wells." In conjunction with master-planners SOM and landscape architects James Corner Field Operations, Morphosis are working to create a new model for high-tech education in the information age by extending the definition of performance beyond traditional notions to incorporate far-sighted social and technological considerations. Reserve your space at Facades+ PERFORMANCE now to take part in an intimate discussion. Brugger will be joined my Paul Martin (Zahner), Tyler Goss (CASE), Matt Herman (Burro Happold), and Marty Doscher (Dassault Systèmes ) on Friday, October 25th at the Illinois Institute of Technology Main Campus in Chicago. Don’t forget to check out our other exciting key-notes, symposia, and workshops on the complete Facades+ PERFORMANCE schedule. The stars are aligning for Cornell’s proposed technology campus on Roosevelt Island. The Morphosis-designed proposal has successfully made its way through New York City’s Uniform Land Use Review Procedures (ULURP), and recently won the support of Manhattan Community Board 8 and Manhattan Borough President Scott Stringer. Two remaining review processes are left, and if all goes well, Cornell will have the green light to start construction by 2014. Manhattan Community Board 8 has approved the Cornell Tech Campus plans and launched it one step further in NYC’s public land use review process. The plan for the 12-acre site now moves forward exactly one year after Cornell University, in partnership with the Technion-Israel Institute of Technology, was selected by the City to develop the applied science and engineering campus. Eagerly anticipating the initiation of its “beta” class, Cornell Tech classes will begin in January of 2013 in Chelsea buildings that were provided to the school free of charge by Google while development of the campus continues. Pritzer Prize winning architect and design director at Morphosis Architects—Thomas Mayne—will be designing an academic building for the new campus along with other notable names such as Skidmore, Owings, and Merril and landscape architect James Corner of James Corner Field Operations. The new campus, which revealed updated renderings in October of this year, will encompass 2.1 million square feet of development, house approximately 2,000 full-time graduate students, and will boast a net-zero academic center that produces as much energy as it consumes. Full build-out is expected for 2037 with the first phase—covering 790,000 square feet of development—being completed in 2017. Applications for Cornell Tech’s M. Eng program are currently being accepted.